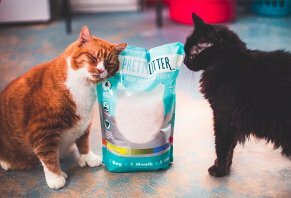 I was actually pretty skeptical when I first started reading about PrettyLitter. I mean, how much better could it be? But I’m completely hooked now, and we’ve been using it for several months. We have three kitties; all different ages, and they all adjusted to it immediately with no issues. It legitimately lasts all month, and cleanup is a snap. I love not having to haul litter home once every week or so, and there’s just no smell now. I haven’t had any health issues so far, but one of my guys is a 17-year-old male, so I appreciate the fact that it can help look for issues. I love it! When I heard that one bag would last for a month, I couldn't believe it. I ordered it anyway and I have been amazed that the product works exactly as they describe. As long as you remove the solid waste daily and stir the litter, there is absolutely zero odor. I am a believer and will use this litter from now on. I have been using PrettyLitter for one month and am definitely reordering. I have one cat and the one bag a month works perfectly. I was concerned with the odor control as that is my #1 priority and it definitely lived up to its claims.